The metallized polyester films are the polymer films that has the coating of the metal especially aluminum. These films are coated on one side and plain on the other side. These films are primarily used in the packaging, decoration, insulation and electronics. The coating of the aluminum on the films reduces the permeability to light, water and oxygen. The metallized polyester films have superior quality in comparison to the aluminum foil such as low density and heat sealing abilities. These films have low cost in comparison to aluminum foil. The global metallized polyester films market is predicted to grow at a significant CAGR during 2018-2027. The increasing usage of the metallized polyester films in various food and beverage and packaging industries is anticipated to be the primary reason for the growth of the global metallised polyester films market during the forecast period. 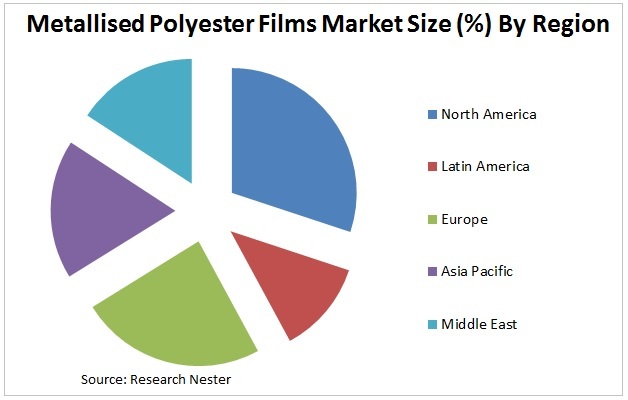 However, unacceptability of the aluminum in different countries of Europe is the major challenge for the global metallized polyester films market.